ONCHAN, Isle of Man – August 22, 2018 – More PokerStars Ambassadors have released routes for players across the globe, to get their hands on a PokerStars Players No Limit Hold’em Championship (PSPC) Platinum Pass as part of the Platinum Pass Adventure. All of these ambassadors are encouraging players to do something that is important and close to their hearts. 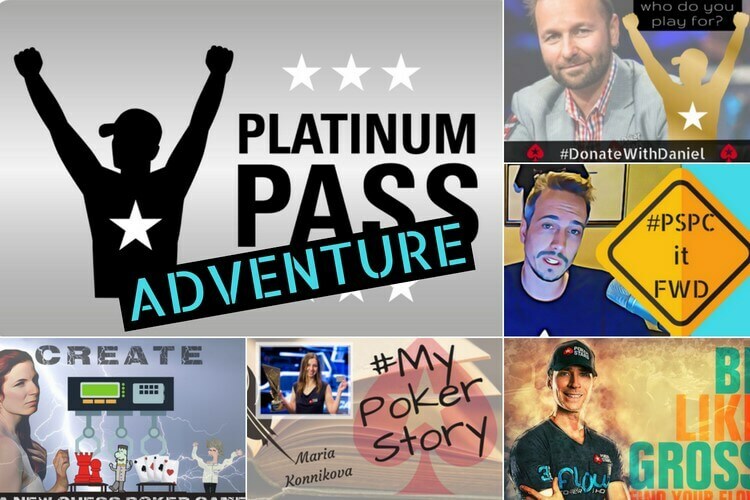 Daniel Negreanu and Lex Veldhuis are getting their community to do something charitable and Jen Shahade, Maria Konnikova and Jeff Gross are focused on encouraging players to challenge themselves by doing something creative and skilful. Launch video can be viewed here. The result will be 11 lucky players following in the footsteps of 22-year-old insurance broker from United Kingdom, Chris Martin, who won the first Platinum Pass package after being chosen by Fintan Hand and Ben Spragg as a wildcard in their eight-week PokerStars Platinum Pass Adventure promotion. Daniel Negreanu is challenging his community to submit a short video about a charity, cause or foundation that is close to their heart using #DonateWithDaniel by September 30. Following this, Daniel will then shortlist his top five entries and announce in his vlog why they were chosen. On October 13, the ultimate winner will be revealed and the other four charities in the shortlist will receive a $1,000 donation. If the winner is lucky enough to cash or win the PSPC, 50% of their winnings will be donated to the cause they are playing for. “You can make a huge difference for yourself and make the world a better place at the same time. So... Who do you play for?” said Daniel Negreanu. Jennifer Shahade is challenging her community to create a game that incorporates elements of both chess and poker. Jennifer will narrow down the submissions and the ultimate winner will be announced on October 14 via a panel of personalities and experts from gaming, poker and chess such as PokerStars Ambassadors Daniel Negreanu and Liv Boeree as well as International Master and Chess.com content director Danny Rensch. “Poker is not just a game, but a passion, a science and a community, just like my first love, chess,” said Jennifer Shahade. Author and journalist Maria Konnikova is on a quest to find the most compelling story teller that demonstrates a core principle of what it means to be a good poker player; be it self-control, probabilistic thinking or decision-making, to name a few. “I truly believe that creativity and storytelling ability are among the most valuable and most often overlooked skills in poker - and I can't wait to see you embrace those skills in this challenge. I’m so excited to announce my Platinum Pass challenge: a call to tell me your stories, in your own voices,” said Maria Konnikova. PokerStars Ambassador, Twitch streamer and YouTube vlogger Jeff Gross is on a quest to find the best poker vlogger through a series of challenges. Read more on the PokerStars Blog. “To have the opportunity to encourage someone to create something they are passionate about and give away a once-in-a-lifetime experience trip to the PSPC means the world to me. This is an event that will go down in history as one of the most special poker tournaments of our time. I am grateful to be playing in this event and giving away a PokerStars Platinum Pass on top of that is truly incredible! My hope is that people will truly enjoy the experience and may even continue to vlog in the future,” said Jeff Gross. Following his success and the supportive community he has built up on Twitch, Lex Veldhuis will be encouraging his fans to simply go out of their way to do something nice for someone. “When thinking about this challenge I really wanted to encompass what makes Twitch special for me. Then it became very simple. It’s people anonymously doing stuff for others. Going out of their way to do something nice or be there for someone. It’s a win-win contest as those who do not win a Pass will still feel like they have won by doing something they cherish, and people will have received something nice because of them,” said Lex Veldhuis. The new programs, crafted by each Ambassador and tailored to suit their audiences, provide players with creative routes to qualify for a Platinum Pass through online and live paths. Winning players will also receive mentoring and coaching from their PokerStars Ambassador in preparation for the PSPC in January 2019.